(Nanowerk News) Scientists and engineers at the University of Wisconsin-Milwaukee (UWM) have discovered an entirely new carbon-based material that is synthesized from the "wonder kid" of the carbon family, graphene. The discovery, which the researchers are calling "graphene monoxide (GMO)," pushes carbon materials closer to ushering in next-generation electronics (see paper in ACS Nano: "Evidence of Nanocrystalline Semiconducting Graphene Monoxide during Thermal Reduction of Graphene Oxide in Vacuum"). Currently, applications for graphene are limited because it's too expensive to mass produce. Another problem is that, until now, graphene-related materials existed only as conductors or insulators. "A major drive in the graphene research community is to make the material semiconducting so it can be used in electronic applications," says Junhong Chen, professor of mechanical engineering and a member of the research team. "Our major contribution in this study was achieved through a chemical modification of graphene." 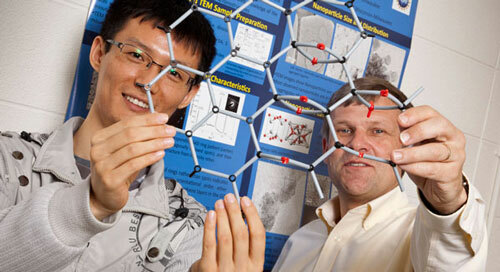 Physics Professor Michael Weinert and engineering graduate student Haihui Pu display the atomic structure on GMO. So the pair turned to physics professor Carol Hirschmugl, who recently pioneered a method of infrared imaging (IR) that not only offers high-definition images of samples, but also renders a chemical "signature" that identifies which atoms are interacting as sensing occurs. Chen and Gajdardziska knew they would need to look at more attachment sites than are available on the surface of a carbon nanotube. So they "unrolled" the nanotube into a sheet of graphene to achieve a larger area. That prompted them to search for ways to make graphene from its cousin, graphene oxide (GO), an insulator that can be scaled up inexpensively. GO consists of layers of graphene stacked on top of one another in an unaligned orientation. It is the subject of much research as scientists look for cheaper ways to replicate graphene's superior properties. In one experiment, they heated the GO in a vacuum to reduce oxygen. Instead of being destroyed, however, the carbon and oxygen atoms in the layers of GO became aligned, transforming themselves into the "ordered," semiconducting GMO – a carbon oxide that does not exist in nature. "We thought the oxygen would go away and leave multilayered graphene, so the observation of something other than that was a surprise," says Eric Mattson, a doctoral student of Hirschmugl's. But the next step is more science. The team will need to find out what triggered the reorganization of the material, and also what conditions would ruin the GMO's formation. "In the reduction process, you expect to lose oxygen," says Michael Weinert, professor of physics and director of UWM's Laboratory for Surface Studies. "But we actually gained more oxygen content. So we're at a point where we're still learning more about it." The team had to be careful in calculating how electrons flowed across GMO, he adds. Interactions that occur had to be interpreted through a painstaking process of tracking indicators of structure and then eliminating those that didn't fit. "It was a long process," says Weinert, "not one of those 'Eureka!' moments."